Have an idea? Want to design its best version? 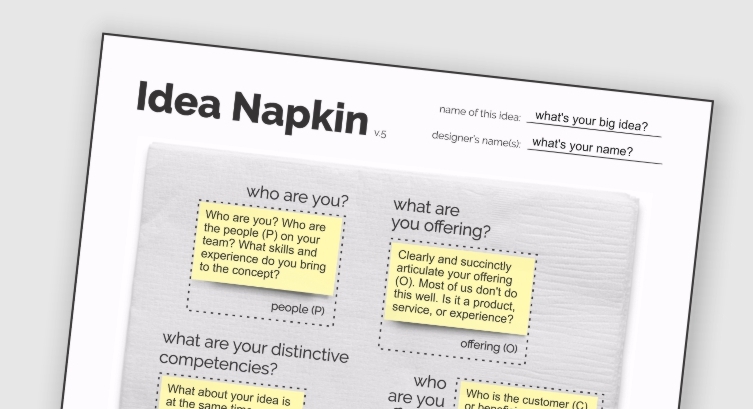 The Idea Napkin is a tool for people who want to start and lead something impactful – whether it’s a trendy restaurant, a high tech venture, a social business, any old project at work, or a personal project of passion. It’s for those of us still sitting on a bit of a hunch, who don’t know where to take it next. It’s for the quiet leaders among us mustering up the courage to leap on one of so many ideas. And it’s for you if you’re already working on something that you want to make better. Begin by literally sketching your idea on the back of a napkin – but with some help and a little bit of discipline. Get your idea written down! One of the biggest challenges smart, hard working people face when they want to start something is actually starting it – we’re often scared or unsure about how to take that first step. The Idea Napkin gets you over this psychological hurdle by providing a canvas for your idea and by taking you through it step by step. Unlike the back of a real napkin, this tool helps you work through the key components of a good early-stage idea – using best practices in entrepreneurship and innovation. By understanding and working through each of these areas, you can clarify and advance your thinking.